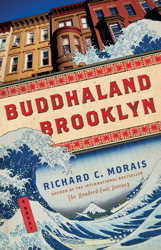 My good friend, Lolli Franklin, joins us today as a guest reviewer, reviewing Buddhaland Brooklyn by Richard Morais. Buddhaland Brooklyn took me by surprise. Less about religion and more about acceptance and appreciating the differences and similarities in others, this book was a delightful Summer read. Seido Oda is a simple man. He grew up in the mountains of Japan with his parents and siblings, and later with his brothers in the Buddhist temple near his home. As a devoted but very introverted Buddhist priest, he doesn’t know much beyond life in the Head Temple grounds. He wasn’t prepared when, in his 40th year, he is assigned to open a Buddhist temple in New York City. The cast of characters that meet Reverend Oda as he journeys across the ocean and into the heart of Brooklyn is full of life – laughter, love, pain, and faith. The New York City “believers” are not what Reverend Oda expected, and the language barriers are not the only challenges to conquer as they prepare to build the new temple. As he gets to know the individuals in the Buddhist community, he begins to understand more about himself and experiences his own faith awakening in a way he didn’t think possible. I recommend Richard Moran’s new book as a refreshing, uplifting read for people of all faiths. Written by Lolli Franklin, mother of 5, photographer, and avid reader (when she can find the time). You can find Lolli blogging at Better in Bulk and tweeting at @1momof5. It sounds like a great read! Now that kiddo is going back to school, I should have time to sit down a read again! Oh… I’m going to have to pick this book up! Thanks for the insight, I’ve been looking for a book to read for the last couple of weeks of summer! This sounds really interesting. Thanks for sharing! Sounds like a great book, I’ve been truly trying to read more this summer. Will have to try to get it on Kindle. I had 5, now I have 6 books to read the rest of the summer. Keep em coming! Sounds like something I’d enjoy…and I was just in NYC. Thanks for the recommendation!